It’s an incremental update, but a good one. We can all agree that Dell’s latest XPS 13 with Kaby Lake is an incremental update. But when your ultrabook is the one that’s being copied by everyone, that’s not such a bad thing, is it? Externally, you’d be hard-pressed to tell the difference between the latest XPS 13 and its direct predecessor. You still get that beautiful InfinityEdge, nigh-zero bezel that lets Dell put the guts of a 13-inch laptop into the body of an 11-incher. The outside is still brushed aluminum and the keyboard deck, carbon fiber. Three generations of InfinityEdge PCs. Dell knows it has something good, so it hasn’t changed its XPS 13 much for three generations. The real changes are inside, where you’ll find Intel’s latest 7th-gen Kaby Lake CPU, basically a souped-up Skylake chip that’s roughly 10 percent faster. On the GPU side, you'll see a similar boost. Dell also increases the battery capacity by using slightly denser cells. That takes your fuel tank from about 57.5 watt hours to 59 watt hours. The trackpad on the latest XPS 13 has less friction than more rubbery-feeling predecessors. I think the keyboard is still a tad small, though. Although Dell says the trackpad hasn’t changed, to my fingers, the trackpad definitely feels less rubbery than before, and more similar to the Microsoft Surface Book's silky-smooth glass version. I have no complaints. The keyboard, unfortunately, hasn’t changed either. It’s not a bad keyboard, and I’ve used an older XPS 13 for several months. Still, I’d still be remiss if I didn’t mention that the keys just feel a tad bit small versus the competition. And no, I don’t mean Apple’s MacBook, I mean HP’s Spectre x360, which gives us a roomy keyboard. Ports don’t change either: You still get a Thunderbolt 3 using a USB-C, as well as two USB 3.1 (10Gbps) Type A ports. There’s also a cowardly headphone jack and SD card reader too. 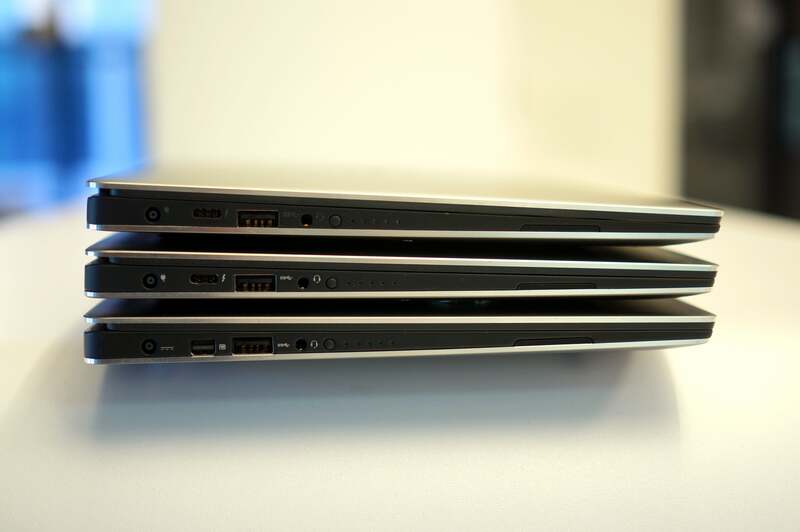 The newest XPS 13 (top) has the same ports as the previous iteration (middle) and let you charge via USB-C. The oldest XPS 13 (bottom) has a mini-DisplayPort. Like the previous version, charging is done via the legacy Dell barrel charger or by using a USB-C Dell charger. Our unit came with the legacy barrel charger, but I've tested the XPS 13 with USB-C chargers from Dell, HP, Google and Innergie with no issues. It’ll also work with Dell’s own USB-C external battery pack brick. What this really comes down to is Intel’s Kaby Lake so let’s get on to it. The review model here was equipped with an Intel Core i5-7200U, 8GB of LPDDR3/1866 in dual-channel mode, and a 256GB M.2 NVMe PCIe drive. The screen is a 1920x1080 IPS non-touch panel with a light anti-reflective coating. Dell offers touch and 4K display options, but they cost more money and eat the battery, too. Our first test is Cinebench R15, a 3D rendering benchmark using the same engine that Maxon uses in its Cine4D application. 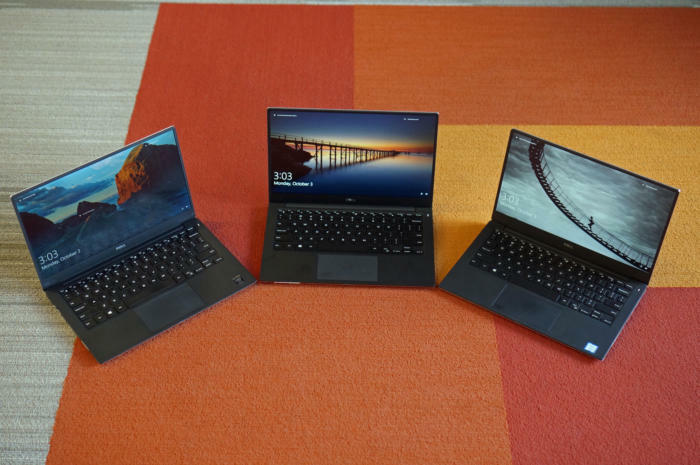 For comparison, we have a Broadwell Core i5, a Skylake Core i5, and finally, I threw in the Gold XPS 13 with Intel’s higher-performance Skylake Core i7 and Iris graphics aboard. Kaby Lake is based on the same 14nm process as Broadwell and Skylake—Intel's backup plan when it couldn't move to a smaller process as planned. 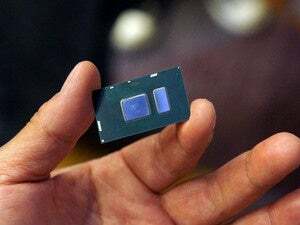 Intel took its experience making Broadwell and Skylake and squeezed higher clock speeds out of the chip while using nearly the same amount of power. As Cinebench R15 is a CPU benchmark, all the performance gains you’re seeing come from the higher megahertz of Kaby Lake—about 10 percent more clock speed and performance over Skylake. Here's a bonus: The Core i7 Skylake, with its fancy eDRAM cache, can’t pull away from the Kaby Lake chip either. 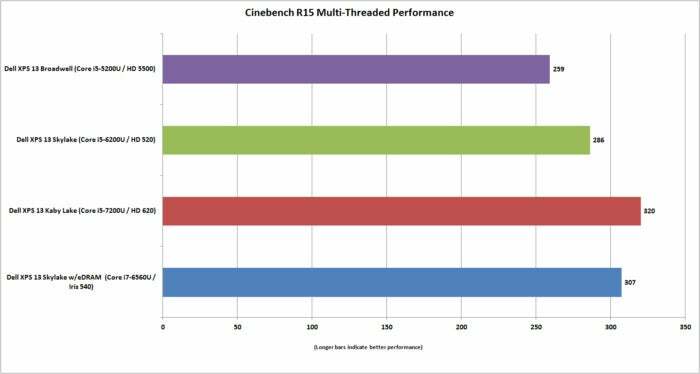 The 7th-gen Kaby Lake in the latest XPS 13 comes out on top in the Cinebench R15 CPU test. 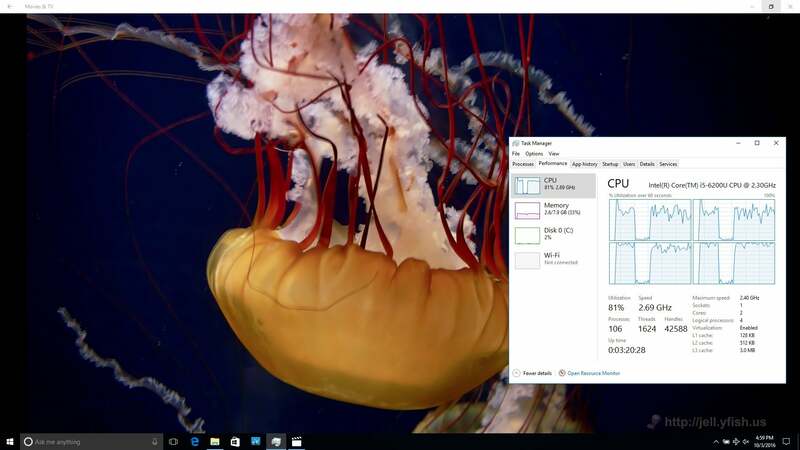 Cinebench R15 takes just a few minutes to run. 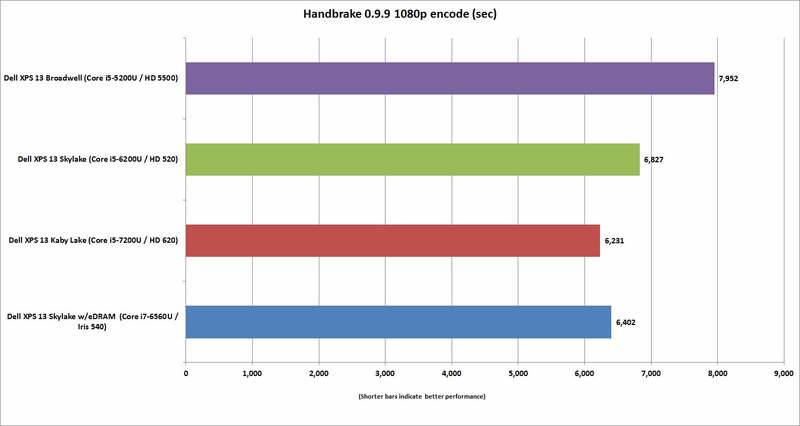 To see how laptops fare under a longer load, we use the free and popular encoder Handbrake to convert a 30GB high-resolution MKV video file using the Android Tablet preset. The entire process can take up to two hours on a dual-core Core i5 or Core i7 CPU. 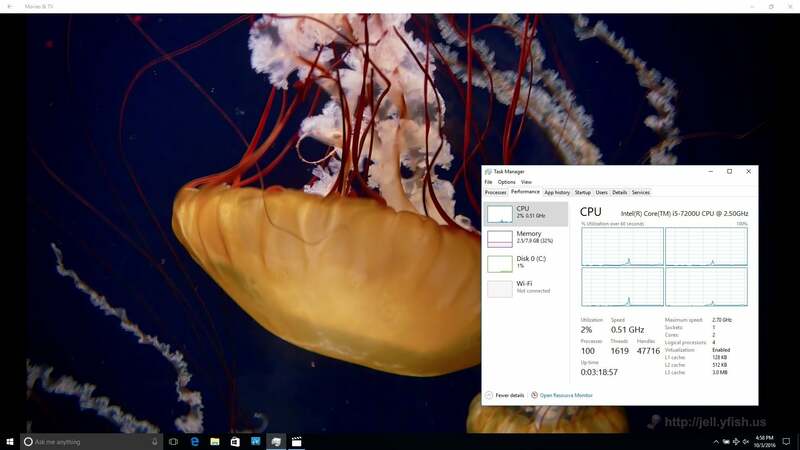 On a desktop or larger laptop, cooling generally is not an issue. On tiny little laptops, this test can function as a performance test or an indicator of how well the laptop handles heat. Some laptop makers will opt to reduce performance to keep the laptop cooler and the fan noise down. Dell, generally, favors performance. That pattern doesn’t change here, as the Kaby Lake-based XPS 13 comes in well ahead of its siblings and again bests even the pricier Core i7 / Iris-based XPS 13. The Kaby Lake outpaces even the Core i7-based Skylake chip with its fancy-pants Iris graphics and eDRAM. For graphics performance, I tested all four units using Futuremark’s synthetic gaming test, 3DMark Cloud Gate. It’s a test made lower-ambition laptops that lack discrete graphics—all models tested here rely on the graphics integrated directly into their Intel CPUs. The Kaby Lake chip comes out well ahead of the 5th-gen Broadwell and 6th-gen Skylake. I’d say it does pretty well against the Dell XPS 13 with its fancy 6th-gen Core i7 and Iris graphics, too. The Iris graphics and eDRAM don’t give the Core i7 much of an advantage in Cloud Gate. 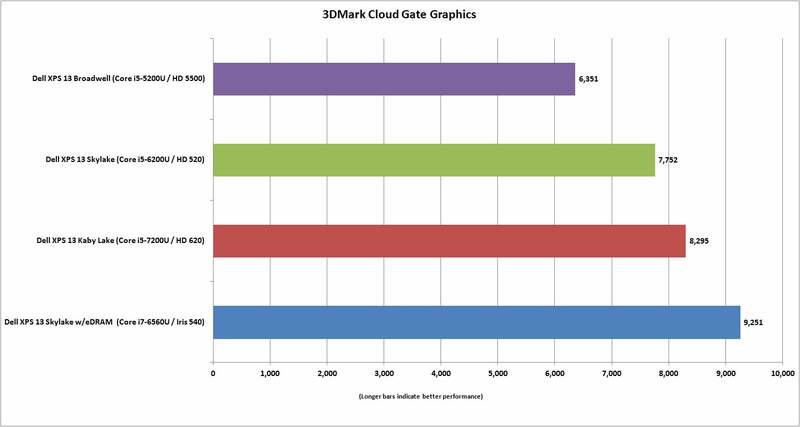 To be fair to Iris graphics, the overall Cloud Gate performance score does factor CPU performance into its final score. When you look at only the graphics performance, the Iris graphics and the 64MB of eDRAM used as a buffer give it a respectable 10-percent advantage. 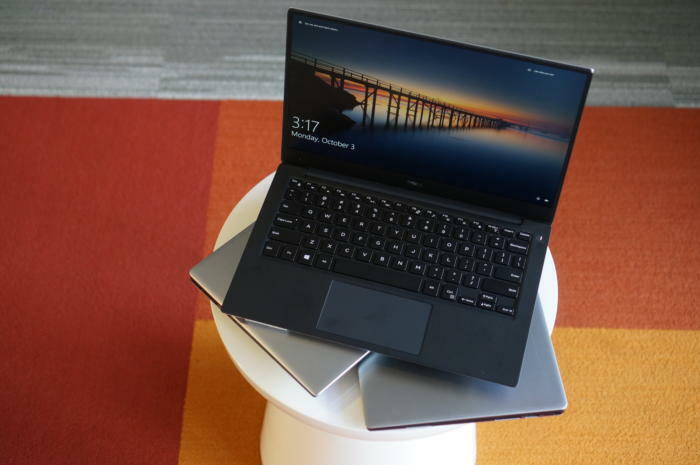 Cloud Gate favors the XPS 13 with 6th-gen Core i7 when only graphics is factored in. I expected to get pretty good run time out of the slightly larger battery on this laptop, and I did. Our test loops a 4K video file in airplane mode with sound enabled (using ear buds). The screen is set to a fairly bright 250 to 260 nits, which is a good setting for watching a movie in a typical office or home. While you might look at the results and decide Kaby Lake gives you more battery life over Skylake, there are differences between the two Core i5 XPS 13 units in SSD power consumption. 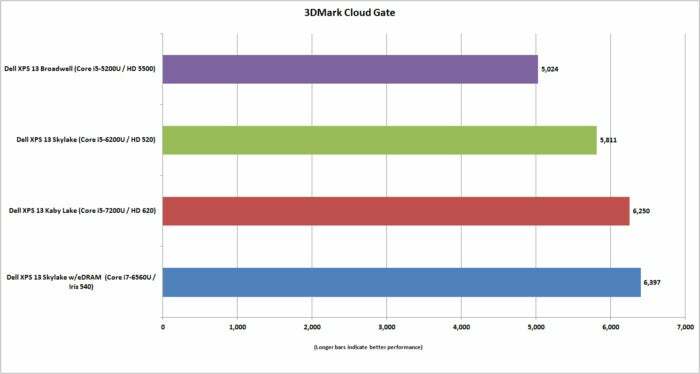 The Lite-On SSD in the Kaby Lake XPS 13 is far more power-efficient than the one in the Skylake XPS 13. SSD performance may also play into the battery life of the 5th-gen Broadwell: That particular generation of XPS 13 used an M.2 SATA drive rather than the more power-hungry NVMe PCIe drives of the newer models. If you're wondering just how much of a power hit you can take from a higher-resolution screen with touch, just look at the loser in all this: the gold XPS 13, which gives you about six hours of video vs. the 11 hours of the Kaby Lake XPS 13. 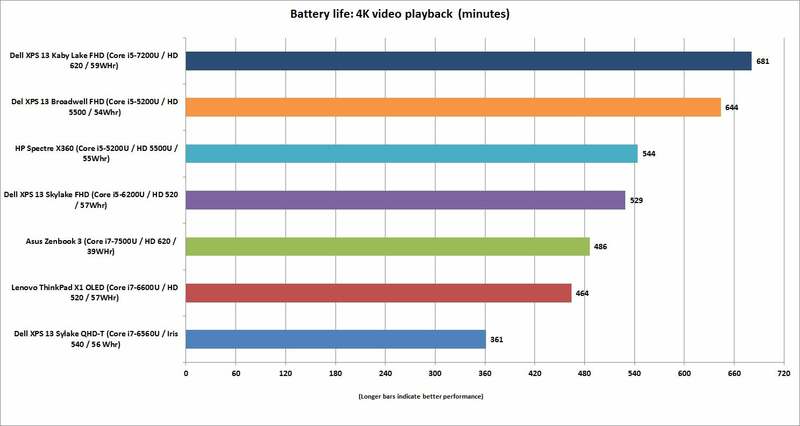 The Kaby Lake XPS 13 has pretty great battery life while playing video. Perhaps the most significant improvement with the 7th-gen Kaby Lake chip is the video engine. Intel basically added hardware support for 10-bit HEVC video, and boatload of other encoding and decoding features. Of course, 10-bit HEVC and other support doesn't yet matter for most of us, but it’s something keep in mind. The practical upshot is you can actually play video encoded using 10-bit color on the Kaby Lake, while a Skylake or a Broadwell machine would just spit furballs. Here’s the proof in pictures: Playing a 1080p file encoded with 10-bit color saw the Kaby Lake XPS13 basically at idle. The 7th gen Kaby Lake CPU in the latest Dell XPS 13 can play 10-bit color video files without breaking a sweat. Without the hardware support in the GPU, that means the CPU is doing all the work. Decoding that Tears of Steel video file with 10-bit color depth isn’t easy, either. 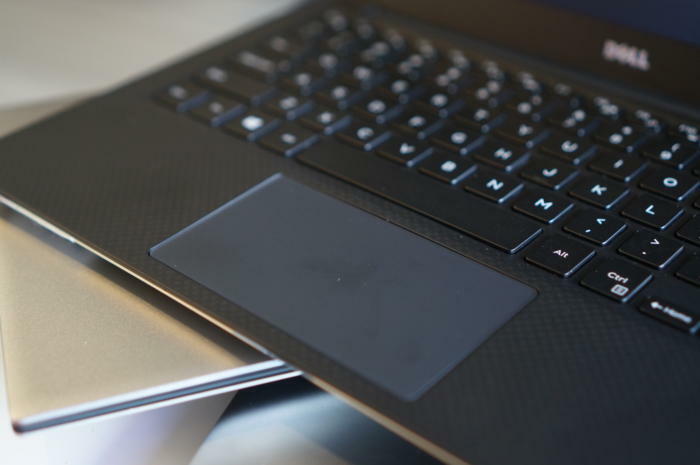 It took battery life on the Skylake-based XPS 13 to a dismal three hours. That higher clock speed means more power consumption, which means less battery life. The Kaby Lake XPS 13, though, took a minimal hit and could loop the video for 10.5 hours. Skylake can’t handle video files encoded at 10-bit color depth without cranking up the CPU and even then will drop a massive amount of frames. 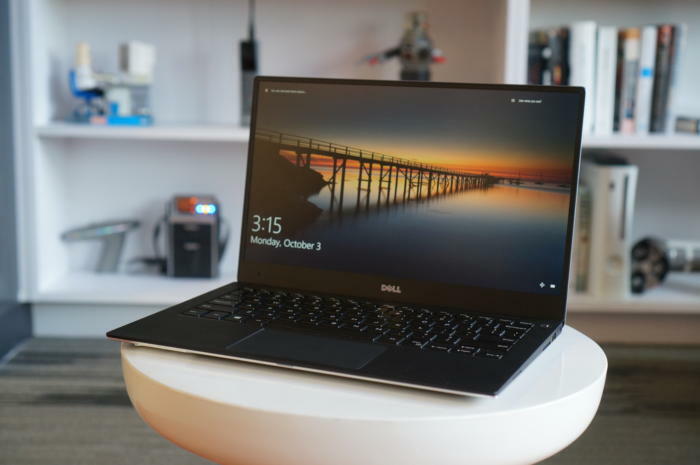 If you’re already aboard the Dell XPS 13 train, you don’t need to be told how great of a laptop it is. The question you’re probably asking is whether you should upgrade. I’d say it depends. If you own a 6th gen-based Skylake chip based XPS 13, I’d say no. The performance bump you’re getting is maybe 10 percent or so. Because that revision of the XPS 13 already has Thunderbolt 3 and USB-C charging and NVMe drive support, it just doesn’t make sense for anyone who isn’t made of stacks of $100 bills. When you step back one more generation to a 5th-gen Broadwell-based XPS 13, then it starts to get interesting. You get roughly a 20-percent or more performance increase, a much faster NVMe drive and Thunderbolt 3, plus the ability to do USB-C charging. Coming from that generation of XPS 13, it’s a very decent upgrade, especially if you can sell your older unit to a friend or family member. In the end, you can look at Dell’s latest XPS 13 as a “if nothing’s broken, don’t fix it” moment. It’s arguably one of the best if not the best laptop available. You get that beautiful InfinityEdge display, a super-compact body, and oodles of performance. Not that anyone should be resting on their laurels, because the competition isn’t going to sit still for much longer. For now though, it would be hard to beat the XPS 13. Some may ding the XPS 13 for not changing much but it’s clear the latest one is the best. Features latest generation Intel 7th Generation CPU.